After my brief rant concluding that the new icewine DO in the Penedés was a crock of bureaucracy, I was contacted by David Furer, the original author of the article in Decanter, where the world was first introduced to the news. Evidently, he had a back and forth with Randy DuFour, Export Manager for Vincor Canada – a company with icewine in its blood, as it were – regarding the validity of the new Spanish DO. Published almost 100% in its entirety, we hope you take a moment to comment with your thoughts on its their discussion below. Let the debate begin! I read your article in Decanter this morning…I can’t believe the Spanish gov’t/EU would allow this…what are the German/Austrian producers saying? I am going to stop wearing my Spanish football jersey in protest! I hope you are well, let me know if you are ever in our neck of the woods, for some authentic wines! Thanks for the comments. No word yet from the German speakers but Gramona’s been making this for years only without a D.O. assignation. Then again, Randall Grahm at Bonny Doon had success with this for many years already. Based upon those from Randall and Jaime I’ve tasted I’m unsure if mechanical means of freezing grapes for ice wine is such a bad idea. It does ensure against the vagaries inclement weather can offer thereby allowing for less loss of crop, lower labor costs, and guaranteeing a steadier annual supply of consistent quality. 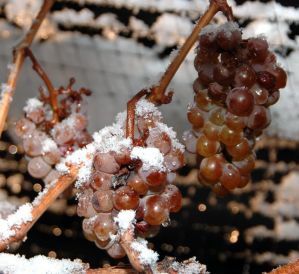 I’ve worked two ice wine harvests in Germany–one with crap grapes and one with stunning–and both were tough work. With Europe warming, harvests for these wines have steadily diminished, another reason to regulate an ‘artificial’ category. the oven and cooked over a period of time? The molecular structure of the bird is the same…cooked…but there is an undeniable difference in taste. Yes, I know they have been making it for awhile, but at least Randall had the good sense to not call it Icewine (legally protected name) and rather called it ‘vin de glaciere’. The Kiwis are employing the same methods but as of last year, are not allowed to call it icewine any more. Come on up here, we only use great quality grapes, consistently, but yes, still a tough job. The promotion of Icewines/Canadian wines in the US is quite bleak. And outside or Inniskillin/Jackson-Triggs, almost non-existent. The National Export Committee is starting to look at opportunities to develop a strategy to promote the awareness and sales of the wines around the world and has identified a couple of core markets; in the US, Chicago has been identified as a good test market to try out and fine tune the strategy/tactics. Along with NY, CA and Florida, I see Texas as being a core market and we should be looking at this in the future. The challenge is that there are limited funds/resources and to be quite honest, a bit of dysfunctionality as a group when it comes to holding hands together and agreeing on strategies and tactics. That being said, how can I help? Sorry for the long-winded dribble, but that new DO got me all fired up. I get your argument but it doesn’t hold up simply because the proof is in the final product. As an aesthete I agree with you that the finest use a microwave oven offers is that of re-heating liquids and to a lesser degree solids, certainly not cooking them; the resultant flavors and textures are sub-par. However, based upon what I’ve tasted of Gramona and Bonny Doon I’ve no problem with their methods and think it’s a reasonable response to weather and market conditions; it doesn’t make financial sense that Randall set up shop in ON nor Jaime along the Mosel. The wines are credible, provide all the necessary info in an open fashion, and let the consumer decide. While I’ve had many great CA ice wines I’ve also perceived greater levels of VA in them on the average than I have comparable wines from Germany (can’t speak to Austria as I haven’t tasted enough examples from it to form a reasonable opinion). The reasons for this were explained to me during my July ’09 visit, happening in part due to the later average harvest dates and something about osmotic pressure and yeast activity during fermentation which helps to create this problem. Again, it’s only my palate but I have tasted my way through hundreds of German and Canadian versions over the years and have noticed a difference. That said, fewer wines of this type are being made in Germany now then in the ’90s due to market pressures (German table wines are hotter now) and climate pressures (Germany’s ambient autumn temperatures are hotter now). How did Randall referring his wines as ‘Vin de Glaciere’ sit with your Quebecois counterparts?! Acidity is our hallmark and what we sell our Icewines on – what makes them unique vs other sweet wines from other regions. As for “yeast activity” it is controlled by the winemaker (there are no wild yeasts in Niagara in January!). To my knowledge, no wine judge or critic has ever faulted our Icewines with too much volatile acidity…not sure if you were tasting our wines, or ?? Don’t even get me started on Quebec, where they refer to their apple juice as frozen Apple wine (outside of Canada as they can’t refer to it as wine in Canada). Anyways, let’s set up a tasting one day and I am willing to eat my words if I am wrong about the quality. Ok so what do you think? Should we be organzing the first ever CRYO-WINE-OLYMPICS? Maybe Catavino should set them up here in Barcelona, just down the road from the “electronic upstarts”? You do know that last year we had a ‘major’ snowstorm here in BCN! Whatever your position, please share your thoughts and feedback as always in the comments below!